Dr. Taylor and his team take the time to explain every treatment and make sure you understand what we plan to do and why - before we do it. Welcome to Taylor Family Chiropractic. 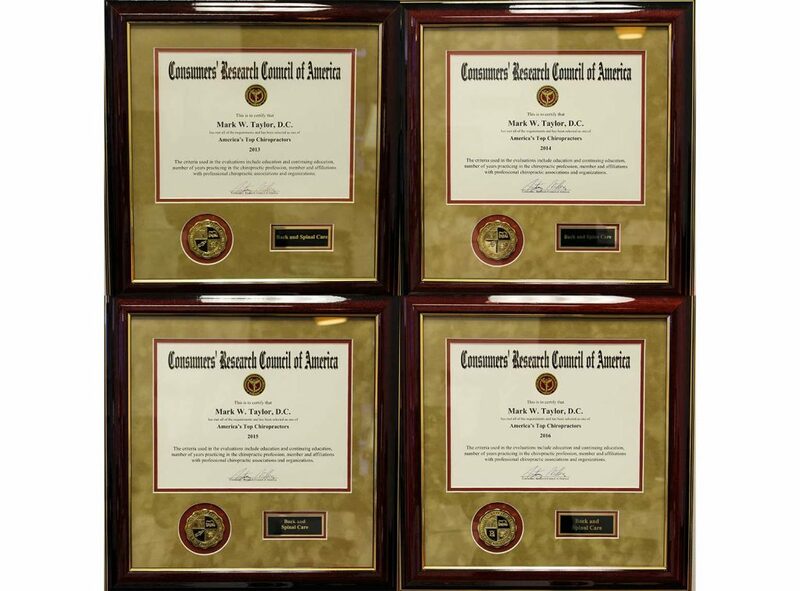 Dr. Taylor has been ranked by the Consumer Council of America as one of America’s Top Chiropractors every year since he began serving the Frisco Community back in 2008. 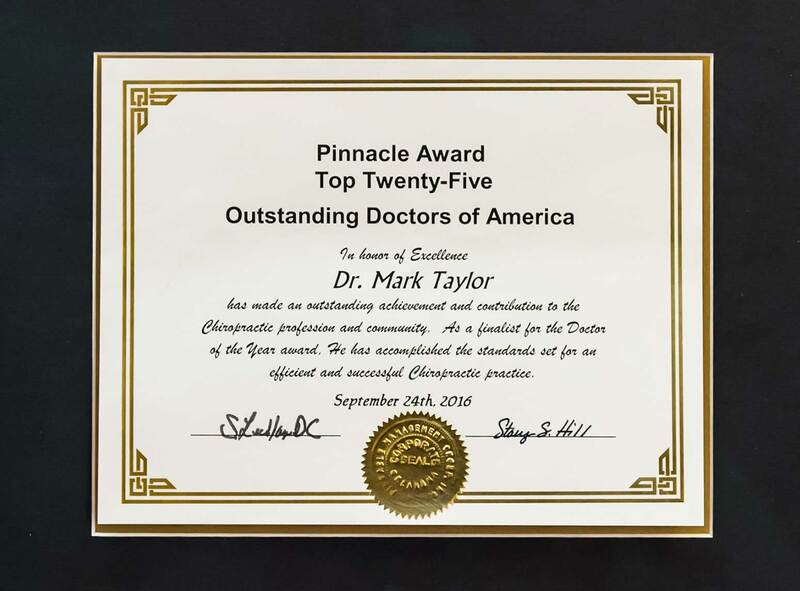 He has also received the peer-nominated Pinnacle Award for Top Twenty Five Chiropractors of America in both 2015 and 2016. 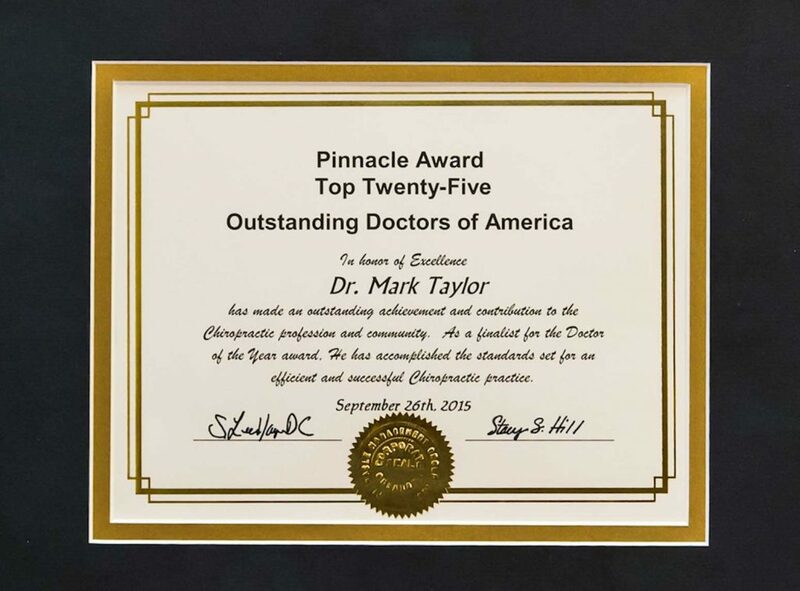 Dr. Taylor has phenomenal success in treating a wide array of conditions including auto-immune disorders, chronic pain, scoliosis, herniated disks, as well as personal injury and whiplash recovery. At Taylor Family Chiropractic, we are aware of the stigmas/urban myths that surround chiropractic and are happy to put those myths to rest. We understand that to run a 95% referral-based practice you must offer your patients two things, results and a level of care that they will never experience anywhere else. We pride ourselves on delivering those two things to our patients. For those of you who are afraid that chiropractic care will be painful, the number one comment we receive from our new patients is, “wow, that wasn’t as bad as I thought it would be.” Dr. Taylor is compassionate towards every patient and is highly trained in 9 different chiropractic techniques to make sure that you remain comfortable throughout your care in our office. We treat a broad range of nerve related, bio-mechanical, neuromuscular, and auto-immune conditions. 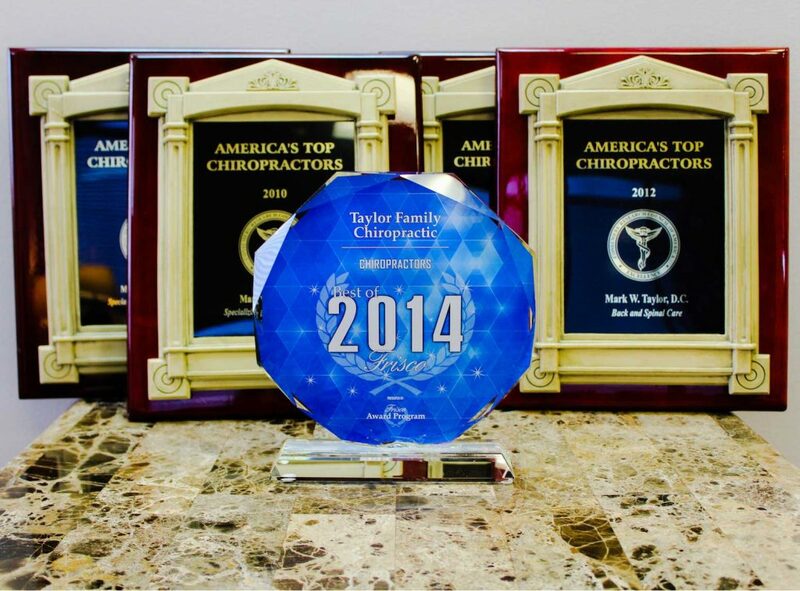 Finding a qualified experienced chiropractor in Frisco,Texas area begins and ends with Taylor Family Chiropractic. We will make sure of it. 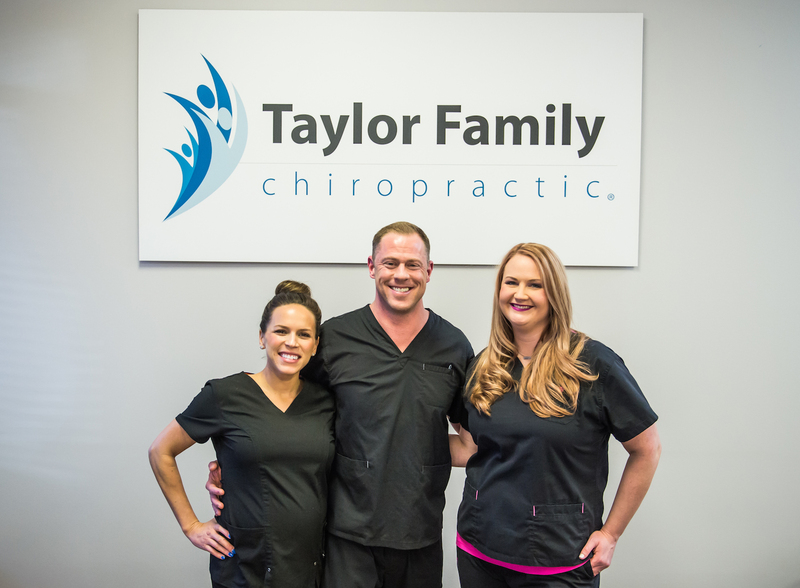 At Taylor Family Chiropractic, we pride ourselves on our ability to get our patients feeling better quickly so they can go back to the activities they love to do. Call us today and take the first step towards the life and the relief you deserve! It pays to stay active. People who exercise regularly are more likely to have better overall health, weigh less and even sleep more soundly. However, exercise can also take a toll on your body, especially your back. If you want to avoid medications and surgery, visiting a chiropractor in Frisco, Texas, might help get you back into top shape. As the home to the headquarters of the Dallas Cowboys, the National League Hockey and the NCAA Division I Conference, Frisco is an active community. With an average of 230 days of sun, Frisco offers an inviting place to exercise outdoors. If, however, you exercise a bit too much, or just strain your back bending over in your garden, it is important to know how to address your pain. You can visit your regular physician and he or she might have some recommendations as to how to reduce your discomfort. One of those recommendations might be to work with a chiropractor who can offer a non-invasive, non-pharmaceutical option towards pain relief. Oftentimes, medical doctors and chiropractors work in conjunction with one another to give you the best care possible. If you are unfamiliar with chiropractic care, it is considered the medical manipulation of the spine and soft tissue by hands on pressure and alignment. The gentle pressure applied by a chiropractor Frisco can restore function to the nervous system, which can be affected by a spinal misalignment. If you suffer from lower back pain, you are in good company; many Americans suffer from this affliction. Generally, lower back is associated with disc problems, the sponge-like material that makes up the vertebra of the spine. Other back issues include degenerative disc disease, scoliosis and sciatica, and all can be treated by a qualified chiropractor Frisco, Texas. Since chiropractic care is centered upon the health of the musculoskeletal system, having a reputable chiropractor manipulate your spine, joints and other soft tissue can help alleviate your pain. Chiropractors also use hot and cold therapies, therapeutic massage and even acupuncture to help with back pain. These non-surgical, non-narcotic methods are very popular with athletes since they require little down time and no dependence on addictive medications. Need Family Chiropractor in Frisco, TX? Dr. Mark Taylor Can Help! Of course, Frisco chiropractor care can help with more than just back issues. Your specialist in Frisco can help with migraine headaches, tendonitis, and fibrosis, just to name a few. Certain ailments including colic in infants, high blood pressure and even allergies can all be treated by a skilled chiropractor. In addition, a chiropractor can also make some lifestyle recommendations to help you to eliminate any aches and pains you may be experiencing. Changes in your posture, diet, and adding some stretching exercises might be…well, just what the doctor ordered. Chiropractic care can also help with serious trauma from car accidents or sports injuries. Since Frisco is such a hotbed for sports, chiropractic care is very popular. Many of the employers around town offer chiropractic wellness programs to their employees as a wellness incentive. As chiropractic care becomes more commonplace and accepted, people are embracing it not only for its therapeutic measures, but to promote ongoing wellness. Additionally, chiropractic care is often covered by insurance; be sure to ask your employer or insurance company about your specific coverage. Finding the right chiropractor in Frisco, tx is the first step to setting you on the right track. Whether you need assistance with an injury, a back strain, or just want to set up a wellness routine, you will want to feel comfortable knowing your Frisco chiropractor has the expertise and skill to help with your specific issue. If you are serious about alleviating lower back pain or trying something new to rid you of a chronic illness, speaking with a chiropractor for an assessment can genuinely help. Since chiropractic care takes a holistic, conservative approach to alleviating pain, you may find you prefer it to conventional medical care. Chiropractic care is a gentle alternative, and works well for all ages, from infants to seniors. As for me and my family, we love Taylor chiropractics!!! We no longer visit the family doctor, because he is our family doctor. He takes care of everything from migraines, ear aches, allergies, aches and pains, even digestion and weight issues. Very sweet office. Appointments are always on time. I can’t say enough wonderful things about Dr. Taylor and his practice!!! Dr. Taylor has helped me, my husband, and my daughter with our various issues. I was using a cane and now I don’t. My daughter had her back issues completely fixed plus I got a grandson! She had been trying for years and after Dr Taylor fixed her back, she g i r pregnant. My husband has had his pain relieved considerably. Chiropractic helps!